And check out OUR NEWLY LISTED ITEMS. 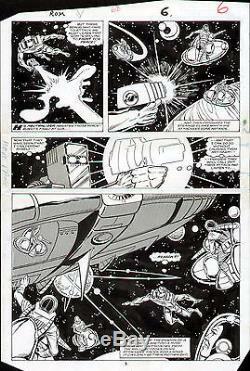 This is an original art page to R. Space Knight #68, published by Marvel Comics in July of 1985. It features artwork by one of the most legendary comic book artists of all-time, Steve Ditko. Ditko is a true legend, obviously best known for his classic 1960's Marvel work, where he co-created the Amazing Spiderman with Stan Lee. After leaving Marvel, Ditko did Silver and Bronze Age work for DC and Charlton, including horror, suspense, and titles like Blue Beetle, Captain Atom, the Creeper, Hawk and Dove, and Shade, The Changing Man. But this is one of his best pages from his 1980's return to the House Of Ideas. 5 from the issue, and is an absolutely stunning half-splash image, with great imagery in outer space. Please note that they cut the page between the top, bottom, and middle tiers and then retaped the tiers together on the back of the page (they may have decided to change the middle panel). It does not really affect the appearance of the front of the page, but we thought it should be noted. As one of the most collected and valuable artists of all-time, Ditko art is always highly sought-after, and classic pages like this are tough to find on the open market, with Spider-man originals already being out of reach for most of us. This is a spectacular page that would look fantastic framed and prominently displayed, and would be an outstanding addition to any collection. Check out our other auctions for more great items. Check it out, you'll be glad you did! The item "STEVE DITKO ROM SPACEKNIGHT #68 ORIGINAL COMIC ART PAGE 1/2 SPLASH MARVEL COMICS" is in sale since Monday, December 01, 2014.